Nine of Swords says analyze your situation carefully now – focus on your priorities and forge ahead. Confront your fears, experience the grief and allow yourself to heal. Complete the process by transforming your pain. Experience pain – identify the “source” of the emotions you are experiencing and then you will know what it is you must change. Stress and depression are the last despair of your rational mind before new possibilities break through from the unconscious and allow it to flow freely. Concentrate on what is most important for you to complete. Immerse yourself completely and totally in your work. Trust in yourself and the course you have committed to. The higher mind takes aim at its own plane. Mind is now keenly aware of self and of the magnitude of what it has asked to be privy. It has asked for and been given access to a level of knowledge which has a commensurate level of responsibility that now demands the letter of the law. The more you know, the more you owe and the more you know, the more you know you do not know and will never know. The only game over which mind can exercise free will in how well it exercises its duties as the caretaker of what it knows. That is a matter of wisdom, the mastery of the management of knowledge. Knowledge and responsibility are Siamese twins – one cannot live without the other, for they share one heart. One cannot carry out responsibility without the knowledge to do so and one cannot be truly knowledgeable without responsibility – because responsibility is inherent in every piece of information. Responsibility is natural, unless it is selectively blotted out by the mind, skillfully separated by the surgical scalpel of potentially errant free will. You take a hard look at objective progress as your goals demand that they be attempted in earnest, if not met. But this mind is not interested in any excuses, from you or anyone else – this is a “pass in review” for what you have achieved, in some cases an actual list – making exercise. Deep conscious thinking and non – thinking – meditation. The ink is drying on your philosophy and goals for this lifetime. Here is the impact of idealism and you will be tough on yourself. This is a time of major decisions, decisions which select a major fork on your path. On these decisions you must build – they are one – way gates through which you will never pass again. You may see here the theoretician, psychologist, philosopher, mathematician or scientist. Next to High Priestess: Be prepared to face the truth – do not be afraid. Next to Star: Have faith and thank God for the blessings you have received – all is not lost. In the first position: This is a path of wisdom with nobility of purpose. Here you become a master of the management of knowledge. As you approach universal mind you are becoming more aware of the darkest dark as well as the lightest light. A pervasive, through not unpleasant, sense of urgency is present. In the second position: You know the names of all the plants in the inner courtyard and you know which are life giving and which are poison. Armed as you are with an encyclopedia of helpful tidbits, you can bring formidable intelligence to any problem put on your table. In the third position: The mind is making a list, so you might as well get out a pencil and write it down. This is a time for turning up the volume. There is a considerable amount of information, perhaps from a number of sources, all vying for your attention. In the fourth position: This is a very prodigious archetype for early emotional tapes. This is the higher mind impressing the heart with its knowledge of the situations that need attention in the world. This young heart not only accepted the challenge to do something about improving the world, it made that challenge its number one priority – its passion. In the fifth position: You are intensely aware of more than you might care to now, but you also know that you asked for it. now comes the task of making sense of everything and in terms of your spiritual path it means literally that – making sense of everything. There is pressure here, but in the sense of exciting challenge. In the sixth position: The higher mind brings greater awareness and with your increased scope of concerns, a testing and realignment for your Emotional Plane. In the seventh position: The mind and its store of information can be either a prison or what liberates you from prison. In the eighth position: The buck stops here. Here is the “pass in review” of all that you have done. There is a wealth of material for consideration, but this is just as you would have it. You may be in a phase of deep contemplation. In the ninth position: The world of your heart is responding to a growing list of concerns presented to it by mind. For, as the mind expands, so does the heart have a blessed opportunity for new relationships and creative expression. This is a time of positive challenge for your heart. In the tenth position: Let the higher Ego come into full play. It is proper for you to be feeling accomplished, on target, wise and a host of other good emotions about yourself. This is not the sin of pride. This is simply the healthy pride of the Ego acknowledging its knowledge. As the self becomes more worldly, literally approaching the World archetype at the end of the Mental Plane, it must feel larger. You are doing just fine – trust in that. I am sorry, but I do not have a blog or news feed. The interpretations are provided to assist people on their own personal journeys. Blogs and news feeds usually try to get me to “pin down” the card meanings and there is no specific meaning to any of them. You could pull the same card a dozen times and the meaning would be totally different each time depending on your question, the card layout and the other cards surrounding it and the information that Spirit is giving you at any particular moment. Hope that helps. 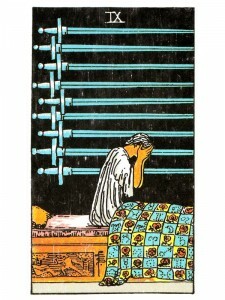 Strong and clear representation of the 9 of swords that appears more ‘constructive’ and less ‘fear-filled’ than others! For that I am truly grateful as I now see it as a ‘way forward’ card to confront and clear perceived obstacles in my life. Interestingly today this card has appeared as a 2nd card to the 3 of cups in the Thoth deck. I drew several cards and used my dowsing pendulum to indicate which were relevant to me at this time. The 3 of cups and 9 of swords are both ‘present’ cards today – and the only relevant cards indicated by my higher self intuition via the pendulum. I’ve now decided that they are collectively indicating that I have full power in deciding which way I want to proceed – do I ask myself ‘what is right in my life and celebrate this’ or do I reproach myself for ‘what hasn’t worked’ and let the ‘too hard/ perfectionist’ self crush the potential of the joyous creative self? Very thought provoking. I thank you sincerely. Aces indicate new beginnings. I read the “people” cards as different levels of energy. Nine of Swords in the 10th position … let go of the past and move forward … keep focused on your goals. A really serious “Thank You” goes out to you for your time & support! You have explained what multiples of the major arcana mean in a reading, what about multiples of the Ace’s (in each suit) in a reading. Get that often too. And if you have the time….how about when someone gets so many Kings, Queens and Knights and Pages in the same 10 card spread? Are those cards always pertaining to different people/personalities? Wow it’s so difficult… I am trying so hard! Lastly…. I got this card (Nine of Swords) in the #10 position of the Celtic Card Spread. It looks like me actually, but not so sure what to make of this one! I am interested in your conclusion over mine, because my conclusion is much too depressing! LOL! I could be over-analyzing everything! Ugh… I am a Virgo after all. I wish my mind would/could just shut up so I can get some rest! (1. Ace of Swords 2. Two of Wands 3. Eight of Swords 4. Ace of Wands 5. King of Swords 6. Seven of Wands 7. The Hermit 8. Queen of wands 9. Nine of Cups 10. Nine of Swords).